The idea of relying on expectations as a means to an end always seemed more viable in theory than in practice. 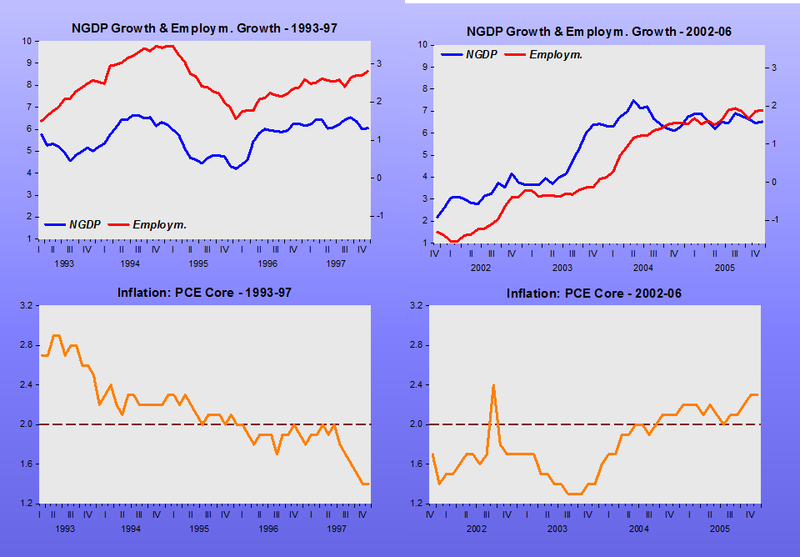 So I was glad to find some support for my reservations from the economics community: specifically, a blog post by William Dupor, an economist at the Federal Reserve Bank of St. Louis, on the subject of inflation expectations. Perhaps it’s a coincidence, but market-based measures of inflation expectations set a near-term peak in January 2014 and have been declining ever since, much to the Fed’s consternation. I always viewed the inclusion of survey measures as a case of confirmation bias: It gave policy makers the answer they wanted to hear. It allowed them to dismiss the sharp decline in market-based measures of inflation expectations, derived from the spread between nominal and inflation-indexed Treasuries, as a distortion due to liquidity preferences. Based on survey measures, they could take comfort that monetary policy was on the right track. An overlooked line in Federal Reserve Chair Janet Yellen’s speech last week could hold the key to whether Friday’s U.S. jobs report clinches an interest-rate increase this month. While the focus was on Yellen’s statement that the case for an interest-rate increase “has strengthened in recent months,” she followed with new language that the central bank’s decisions depend on the degree that data “continues to confirm” the outlook. That, and other recent remarks by Fed officials, suggest that job gains need to be merely solid — rather than extraordinary — to warrant raising borrowing costs for the first time in 2016. If what you want is “comfort”, go lie in the sun, but don´t pin your hopes on irrelevant information. Around the world, markets are in chaos. Japan’s stock market plunged 5 percent on Friday, while markets in France, Germany, and the UK all saw big losses on Thursday. The US stock market is doing better than most, but it is also down since the start of the year. Oil hit a new low on Thursday of $26 per barrel. These declines reflect growing concerns that the world economy is headed for another recession. Before 2007 we’d say “if things get bad, the Fed will cut interest rates.” But with the Fed’s benchmark rate below 0.5 percent already, a substantial cut would mean rates that are below zero. That’s an unorthodox strategy, and it might not even be legal, according to testimony by Fed Chair Janet Yellen before congressional committees this week. The Fed needs a new strategy: Stop targeting interest rates and instead target the growth of the overall economy. Moving away from interest rate targeting would give markets confidence that the Fed has the tools to deal with the next economic downturn, which would reduce the danger of another 2008-style meltdown. Unfortunately, there’s little sign that the Fed is laying the groundwork for a shift in strategy. Instead, Yellen seemed to be in denial about the magnitude of the challenge she is facing. Maybe not — but the Fed needs to be prepared for the worst. So even if the Fed adopted negative rates, it wouldn’t improve the effectiveness of the current interest rate targeting regime very much. 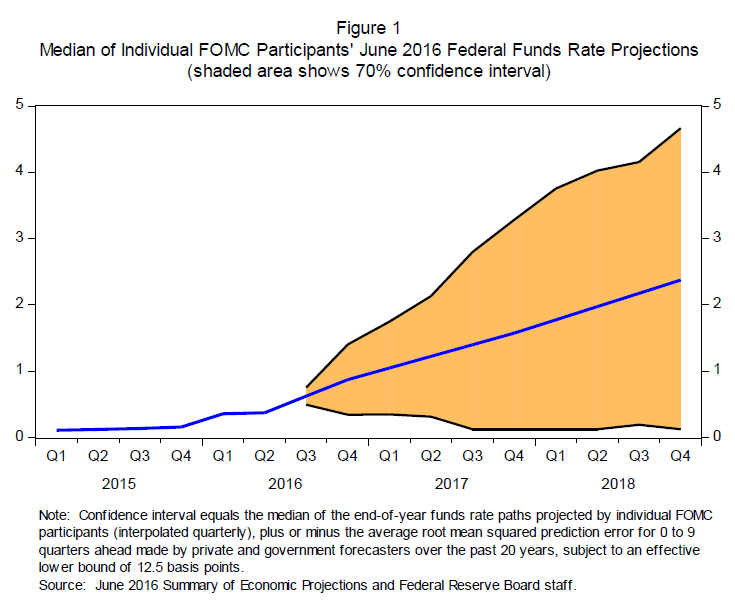 Just as the Fed got stuck at zero percent interest rates in 2008, it could get stuck at -1 percent interest rates in 2017 or 2018. So the Fed is going to need a new framework that’s less dependent on interest rates regardless. It might as well get started. If you demure, it will become harder and harder to do it. You´ll have to be satisfied with an increasingly partial recovery! Naturally, if you wait too long, the present trend level will become the “new normal”! Financial conditions in the United States have recently become less supportive of growth, with declines in broad measures of equity prices, higher borrowing rates for riskier borrowers, and a further appreciation of the dollar. These developments, if they prove persistent, could weigh on the outlook for economic activity and the labor market, although declines in longer-term interest rates and oil prices provide some offset. Of course, economic growth could also exceed our projections for a number of reasons, including the possibility that low oil prices will boost U.S. economic growth more than we expect. To a large extent, the low average pace of inflation last year can be traced to the earlier steep declines in oil prices and in the prices of other imported goods. And, given the recent further declines in the prices of oil and other commodities, as well as the further appreciation of the dollar, the Committee expects inflation to remain low in the near term. However, once oil and import prices stop falling, the downward pressure on domestic inflation from those sources should wane, and as the labor market strengthens further, inflation is expected to rise gradually to 2 percent over the medium term. Policy divergence between the U.S., where the economic recovery is strong enough to warrant a gradual tightening of monetary policy, and Europe and Japan, where downside risks are prompting central banks to boost stimulus, have pushed up the dollar. That appreciation is damping U.S. exports and thereby economic growth, and also contributing to stabilization abroad. All else being equal, a smaller contribution to the U.S. economy from the external sector likely points to a more gradual pace of policy normalization in the United States. By the same token, the economic stimulus from more-depreciated currencies abroad may allow foreign central banks to provide less monetary accommodation — or to start removing it earlier — than would otherwise be the case. Not for a moment does Yellen consider that it may be the tightening of Fed policy, as gleaned from the downward trend in NGDP growth which began in mid-2014, that is responsible for the price effects she alludes to! Ja-net Yel-len, Ja-net Yel-len, are you Tri-chet in dis-guise? At football matches in England there is always a particularly hurtful chant that goes up around the ground when a team, a player or a referee is doing badly. They are very often compared to some team or referee or player whom everyone knows is far worse. It is sung to the tune of a famous hymn, like many football songs, “Guide me, O thou great redeemer”. Janet Yellen’s record so far as Chairman of the Fed reminds of this chant, and particularly Jean-Claude Trichet’s penultimate year (mis)guiding the ECB. 13th July 2011 should go down as a day of infamy in the Euro Area. It was date of the second rate rise by the ECB that year, that tanked markets and led more or less directly to a dramatic liquidity squeeze for Euro Area banks, and caused the plunge into the second part of the Area’s double dip recession. We all now know that Euro Area troubles started in 2008 when the world was plunged into the Great Recession by pro-cyclical monetary tightening by various central banks, just as NGDP growth expectations were falling rapidly at the time of the Lehman default. A lot of other stuff was going on, for sure, but it was noise compared to the core monetary story. The US and Europe had already spent two hard years escaping from the consequences of the 2008 tightening. Then, in an attempt to out-macho the US and impress the selfish German establishment, the ECB under Trichet decided to stamp on headline inflation hitting nearly 3% in early 2011, while core remained solidly below 2%. 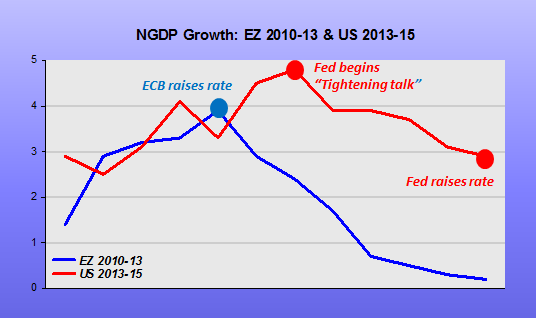 The ECB therefore directly smashed the early stages of recovery with a heavy tightening bias and two rate rises. The different paths of the two big currency blocs has been very well documented here with a good summary here. The first of the rate rises that year on 3th April 2011 did not cause undue damage. 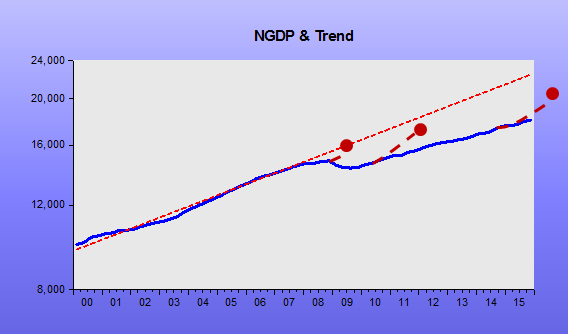 1Q11 Euro Area NGDP had almost hit the dizzying 3.9% YoY. Within the Area German NGDP was at 6.4% YoY that quarter. This was too strong for Germany and so they pressed for a tightening and Trichet was only too happy to oblige, forgetting about the rest of the Euro Area, especially the periphery. In that quarter Spain and Portugal were already enduring marginally negative NGDP growth. Yes, they were in outright deflation but had their monetary policy tightened substantially – it seems really crazy the more you think about it. Greece had very negative NGDP YoY at -9%. Never mind, the selfish, almost anti-European, old DM/German bloc anti-growth bias had to be appeased. Actually, it was even worse, Trichet was actually rather fanatical in thinking he was doing the right thing for the Euro Area as a whole. It was his final goodbye press conference that made me rethink my priors. He was forced to defend what havoc he’d caused by trying to claim credit for giving the Euro Area a lower inflation rate than Germany had experienced prior to the Euro – and hang the consequences of a double dip recession. It was all deeply personal and subjective. Central bankers can do no wrong and certainly cannot take criticism. Well, the rest is history. The Euro Area slowed during 2Q11, as you’d expect from such a tightening of monetary policy. Although the Euro Area stock markets merely drifted, NGDP growth fell to 2.9%. 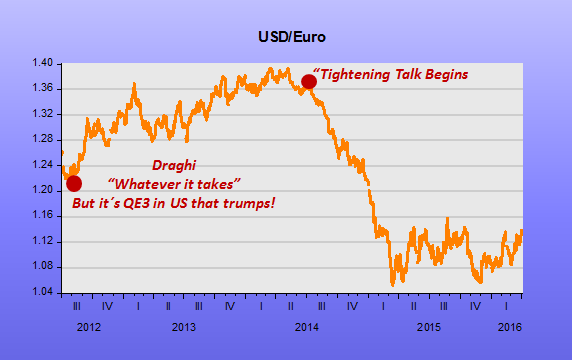 The stock market drift may have lulled Trichet and his ECB into a false sense of confidence. 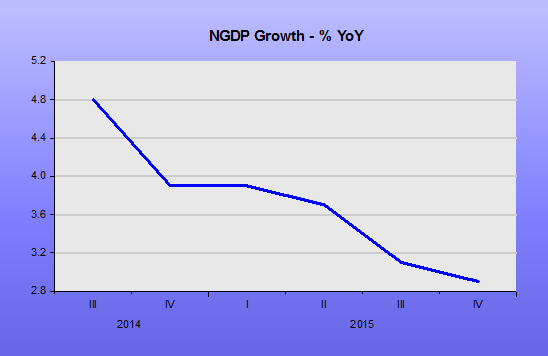 As expectations for NGDP growth dropped further, they made their second fateful move. Stocks tanked within days, the banking crisis re-erupted, engulfing the French bank SocGen in particular. NGDP fell to 2.4% during 3Q and carried out on down. It was too late, the damage had been done and the cycle was hard to turn. We often see articles and blogs wondering whether the US rate rise in late 2015 will end up forcing the country to re-live the great 1937 stumble in the recovery from the Great Depression when monetary policy was tightened too early. The Euro Area from 2011 seems far more apt, and fresh in our memories. A slow recovery, with a few hot spots, was stamped on by two rate rises amidst a severe tightening bias. Rates ended up falling, of course. 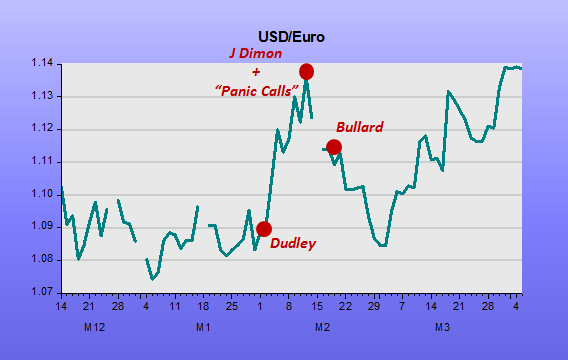 The first rate rise was seen by the markets as almost manageable, or rather it was met with a degree of sang froid. The second seemed mad given where NGDP expectations had tumbled. The December 2015 rate rise seemed to be met with a similar sang froid, after all it had been expected for months. Some, particularly market Monetarists, had warned of the dangers of the monetary tightening and thought actual and expected NGDP growth too weak to cope. The market sang froid was probably mistaken by the Fed as an acceptance that its full-blown “normalisation” programme could proceed as they planned. Vice-Chairman Stanley Fischer’s now notorious 6th January interview on CNBC, especially his articulation that four more rate rises this year was “in the ballpark”. Economic news has been poor since then, reflecting the impact of the 2015 monetary tightening, and now expectations are falling. The question remains: Is Janet Yellen Jean-Claude Trichet in disguise? Will she take some market tranquillity as a justification for a second rate rise? Maybe. Just how much does she fear inflation rising to the Fed’s forecast of 2%, how stubborn will she be in pursuing her “normalisation” programme come what may? When the team, referee or player continue to invite really bad comparisons the football fans often switch to an even more hurtful chant, “you don’t know what you’re doing, you don’t know what you’re doing”. It is sung to the tune of “Que sera, sera” (whatever will be, will be). Fatalistic, but apt. In Japan, the inflation rate is about 1.2% by the Bank of Japan’s alternative index, and the unemployment rate is a scant 3.1%. The stock market is up 15.1% in the last year. Capital spending by Japanese companies in Q3 was up 11.2% year-over-year. Haruhiko Kuroda is the Governor of the Bank of Japan, and the world’s best central banker. Kuroda could wring his hands about “long and variable lags,” and curtail the Bank of Japan’s quantitative easing program, now running about $50 billion a month in an economy half the size of the United States economy. BTW, the Bank of Japan pays 0.10% interest on excess reserves. Contrast the stalwart Kuroda with the feeble, dithering, inflation-cowering of Chairman Janet Yellen and Vice Chairman Stanley Fischer of the U.S. Federal Reserve Board. But first consider: The U.S. unemployment rate is 5.0%, much higher than Japan’s 3.1% rate. 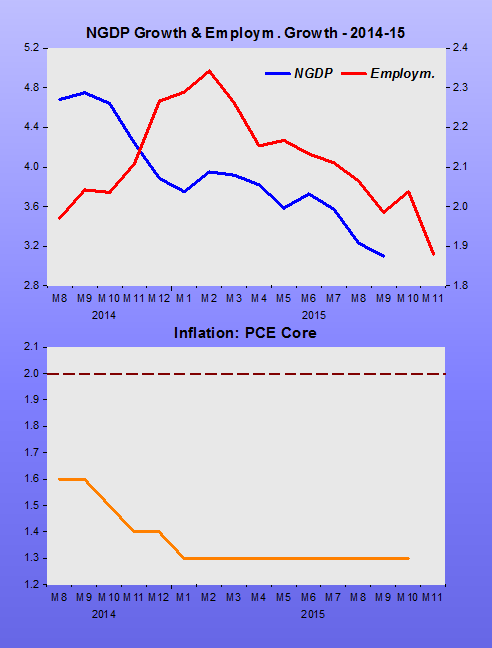 The core U.S. PCE inflation rate is 1.3%, about the same as Japan’s, and below target. The S&P 500 is about back to where it was a year ago, not up 15.1% like the Japan’s stock market. U.S. capital spending is weak, while Japan capital spending is strong. While the mediocre U.S. economy compares unfavorably to Japan’s on many levels, the Fed is actually and presently tightening monetary policy. Think about it: Where Japan does $50 billion monthly in QE, the Fed is shrinking its balance sheet, or reverse QE. Where the Bank of Japan pays 0.10% IOER, the Fed pays 0.25%. And the Fed, after endless fretting, appears ready to raise rates at their Dec. 16 meeting. So we have the U.S. central bank conducting reverse QE, raising interest rates, and paying banks not to lend through IOER. 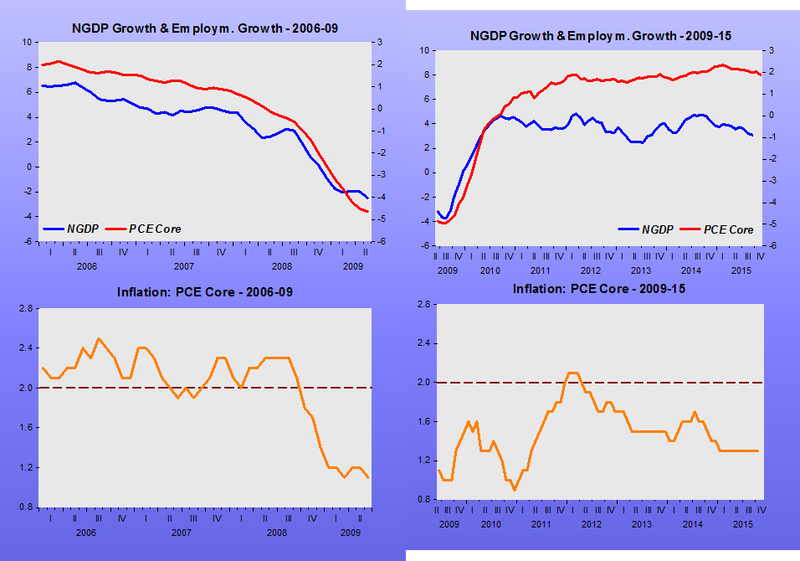 All this while the PCE price index is below target and falling, and real growth is sluggish. Please Mr. Kuroda, come to America. We need you at our central bank.